Six years ago today, I was driving to work along the New Bedford waterfront when I received a frantic call from my editor: Federal immigration agents were raiding a local garment factory. Could I go check out the scene? I pulled a U-turn and headed south toward the Michael Bianco factory, which I would soon learn was employing undocumented workers to fulfill a government contract for military backpacks used by U.S. troops in Iraq. As I approached the factory, now on foot, I saw federal agents dressed in Navy blue “POLICE ICE” jackets and baseball hats herding hundreds of handcuffed workers onto coach buses. Across the street, crowds of co-workers and family members huddled against the frigid March wind. Some sat crying on the ground. Others shouted at the buses in Spanish and Portuguese. I left New Bedford three years ago when I stopped reporting for The Standard-Times. But every March 6, my mind returns to that scene in the south end of the city– and to the 362 Bianco workers who were hauled off in buses and flown to detention centers on the U.S.-Mexico border, while their orphaned children and relatives gathered in church basements awaiting phone calls, legal updates and in the case of some infants– breast milk. Some of the detainees, mostly women, returned to New Bedford to begin immigration proceedings, while others languished in prison for months before being deported to Mexico, Guatemala, Honduras, El Salvador, Brazil, Portugal and Cape Verde. The former group I shadowed for years, visiting Boston courthouses, New Bedford triple-deckers, cultural festivals and rallies for immigrant rights. The latter I tracked down on a 2008 reporting trip to the dusty hamlets of rural Guatemala where the campesinos were as familiar with New England’s geography and economy as any Yankee. It appears as many as 132 of the original Bianco detainees (36 percent) had active court cases five years after the raid– and are likely still living in limbo today. Immigration reform legislation has also stalled in the years following the raid. The Kennedy-McCain Comprehensive Immigration Reform Act of 2007 foundered in Congress during the Bush Administration. And only recently has Obama made another serious push for comprehensive immigration reform. Even that could be derailed by the latest fiscal crisis. I have to wonder which way the March winds will be blowing during next year’s Bianco raid anniversary. Will the country’s 11 million undocumented immigrants– including the 132 limbo-living Bianco detainees –have a clearer path to citizenship? Thanks Becky for thinking of these folks who just went to work that day-many are still in limbo reporting frequently to an ICE monitoring contractor in Burlington , some ( who are Moms of young kids and have no criminal record) are humiliated by wearing monitoring bracelets. There is much anticipation in New Bedford of the promise of Immigration Reform. Hope there is finally some good news in D.C. This year. 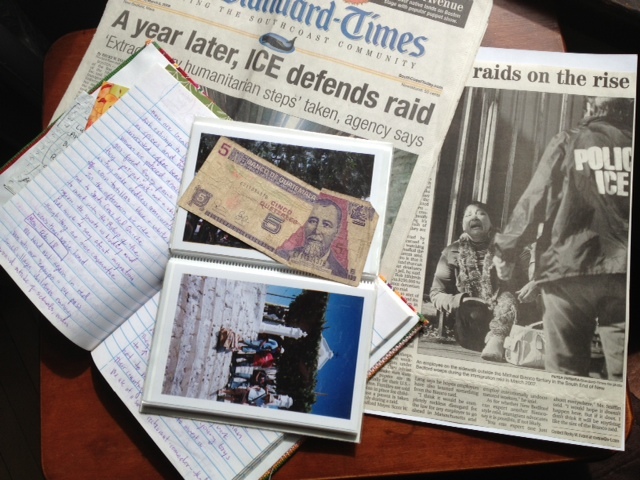 Thanks for your thought provoking article on the immigrants from New Bedford, Becky. I’ve often wondered what has happened to them. Let’s pray for some real reform in the Immigration Reform Act. Take care. Hi, Becky. Thanks for this reflection, something that provides some more context and information to those of us who are newcomers on the SouthCoast. The Centro Comunitario de Trabajadores is having a vigil of prayer and fasting from yesterday through Saturday, and Grace Episcopal Church of New Bedford is hosting it. There’s an article this morning in the Standard Times about it. (http://www.southcoasttoday.com/apps/pbcs.dll/article?AID=/20130307/NEWS/303070351) So it’s not forgotten, and people here this weekend will walk in solidarity with those directly and indirectly affected. I was across from St. James Parish on the 6th anniversary, calling attention to passersby, to the lack of immigration ENFORCEMENT in this community.. These people did knowingly break the law (speaking of all involved, not just the workers) and ought to be held to account. We cannot forget the impact that illegal immigration is having on the local, legal Citizen workforce. NO AMNESTY, NO EXCUSES!